Hey, guys, I thought I would do a slightly different post to what I normally do, instead of doing your average haul showing you what I got, I thought it would be fun to do a First Impression/ Get Ready With Me. All these products were bought either in Boots or Superdrug so all affordable! I am gonna start with the Rimmel Lasting Finish Foundation, I always stick to the same foundation but I thought I would branch out and buy myself something new! Now I have pale skin so I normally go for Ivory, and it's normally fine, however, this Ivory is a tad dark. It is wearable and I can get away with it, however, I just to blend like hell and hope for the best. Other than that, it sat nicely on my face, and gave a dewy finish, which I love! Next up is Bourjois Radiance Reveal Concealer, now my holy grail for a long time has been Collection 2000 concealer but I find it has been oxidizing lately. Maybe it is the weather and my skin but when I seen so many people rave about the Bourjois concealer I thought I would give it ago! It is £4 dearer, which isn't a lot but I use concealer quite a lot so it seems like a big jump! It is a lot thinner consistency which I found made it very easy to blend but also stay in place. With it being thinner, it makes it feel so much lighter under the eyes! It is definitely a better shade for my skin and gives my eyes a brighter/ healthier look! I found it gave the best highlight and just worked perfectly!! Completely worth the money! I did use my Collection Concealer on my spots and blemishes as it is a lot thicker to cover them up! I then use my Rimmel Clear Complexion powder to set my face! Not too much as a wanted a dewy finish! Eyebrow time, I really enjoy doing my brows so I was really excited to use this Maybelline Brow Satin Pencil, I hadn't heard that much about it, one side is a very fine pencil and the other is a sponge so I thought it would be interesting! As you can see I have fair hair so finding something the right shade is quite hard, I think the colour is perfect for me. I got it in the shade Dark Blonde! I was pretty disappointed with this, the pencil was so thin that it snapped so many times and I actually have none of the pencil left! When I was trying to fill my eyebrows in, I found it quite hard to blend and get the right shape and don't get me started on the sponge! As you can see from the picture below I was confused as to what it actually did to my eyebrows, it is so strange! Last product was Rimmel's Sculpting Palette by Kate, in the shade #1. I have actually had this for a while but I thought I would give you my thoughts! The bronzer is just a pretty shade, it has a little shimmer through it but it still is great for contour! It blends easily and gave a gorgeous finish to my face! It will be a go to bronzer in Spring for sure!! The highlight is probably my fav, it is a gorgeous golden shimmer and perfect to make the cheek bones stand out! It applies easily, and sits nicely! It has been my go to highlight for a while! It is such a great price as well! I don't tend to wear blush that much, however, this was quite a natural blush, like the other in the set it blended well and gave a little colour back to my cheeks! The whole set is perfect to take on my travels with me as it is all in one, they are pretty colours and I have been completly in love with it! I then used my Naked Basic 2 palette for my eyeshadow, Maybelline The Falsies for my mascara! I lined my lips with Koko K and applied Sleek's Birthday suit on top and then the look was complete! To sum it all up, the Bourjois Concealer is a must have and I will have to repurchase this again for sure. The Rimmel Sculpting Palette is also a must with the three pretty shades! The Rimmel Foundation will be worn on days I feel a little more daring and have more time but I will use it. However, the Maybelline Brow Satin was a complete fail, I would recommend spending a bit more money for something better, a thicker pencil maybe?? I hope you enjoyed this post, I hope to more First Impressions and GRWM in the future! Did you like this look? Have you tried any of these products? Oh hey pretty lady! I love GRWM posts! It's so interesting to see other people's make-up routines! This is a BRILLIANT post! Love this idea a lot. You look fab, Emma! I absolutely love your new take on a beauty haul, would love to see more posts like this in the future! The Bourjois concealer really does look like it does the job, I'm very tempted to pay the extra £4 and try it out too! Thanks for sharing! Lovely look, you look gorgeous!I love the Rimmel Lasting Finish foundation, mine has actually run out so this is a good reminder to pick another one up! You look beautiful! I love the look of that sculpting kit! You look beautiful!! Love the shade of your lipstick! I've been looking for that sculpting palette for ages. Love the end look. You're gorgeous hun even without makeup. Well despite everything you still look beautiful! I recently bought the Bourjois concealer for a first impressions so I'm glad you like it! And I've used that rimmel foundation in the past when I was going through an awful time with my skin and wanted something high coverage, agree it does feel a little heavy after a few hours though! I keep meaning to pick up the rimmel contour kit. Looks so nice and perfect for on the go! Your makeup looks fabulous! I may have to try out that foundation as it looks so good. That foundation looks gorgeous on you! It's a shame about the brow pencil but I'm loving the look of the bourjois concealer & the rimmel sculpting palette :). I use this foundation and concealer daily, I absolutely love these products as they work so well on my skin and don't cake or crease, result! That lipstick looks gorgeous on you! And I love this post, I always love reading/watching peoples first impressions on makeup products. I really want to try that foundation, and the concealer as I've heard so many great reviews on it! I used to always use this foundation! Not 100% sure why I stopped using it though! The concealer is one of my faves.. 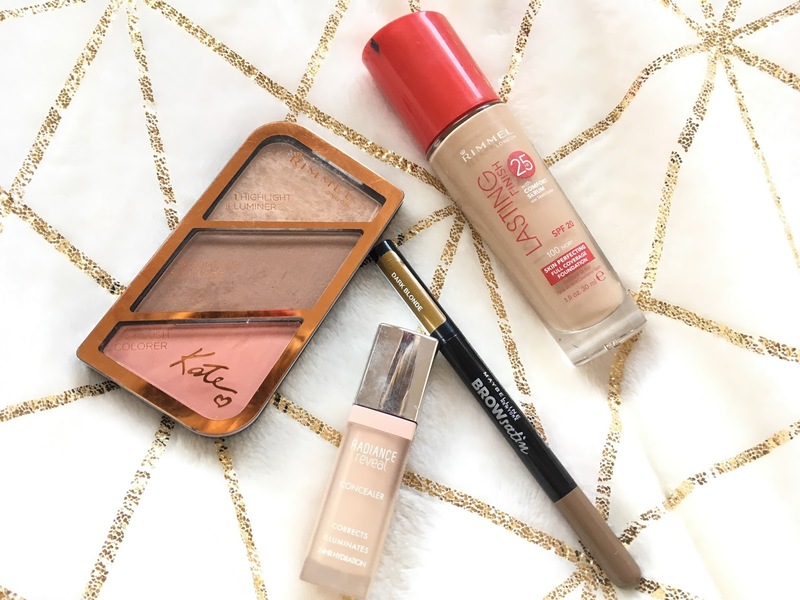 I like to use it with my Collection Lasting Perfection or the UD naked skin concealer as I think it really helps brighten the under eye area up!